Alpena, MI (November 11, 2014) – World Weaver Press (Eileen Wiedbrauk, Editor-in-Chief) has announced the Christmas horror anthology Krampusnacht: Twelve Nights of Krampus, edited by Enchanted Conversation: A Fairy Tale Magazine editor and publisher Kate Wolford, is available in trade paperback and ebook today, Tuesday, November 11, 2014. The joy and terror of the season. For bad children, a lump of coal from Santa is positively light punishment when Krampus is ready and waiting to beat them with a stick, wrap them in chains, and drag them down to hell--all with St. Nick's encouragement and approval. 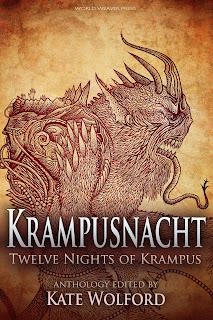 Krampusnacht holds within its pages twelve tales of Krampus triumphant, usurped, befriended, and much more. From evil children (and adults) who get their due, to those who pull one over on the ancient "Christmas Devil." From historic Europe, to the North Pole, to present day American suburbia, these all new stories embark on a revitalization of the Krampus tradition. Whether you choose to read Krampusnacht over twelve dark and scary nights or devour it in one nacht of joy and terror, these stories are sure to add chills and magic to any winter's reading. 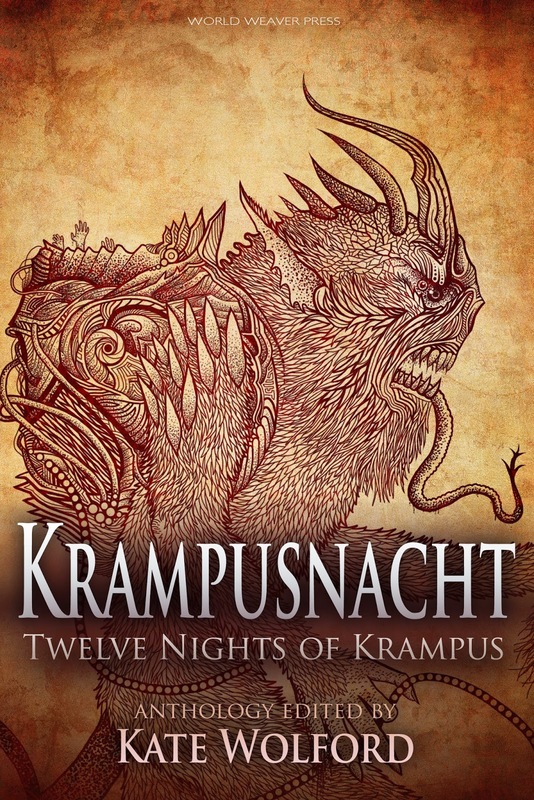 Krampusnacht is available in trade paperback and ebook via Amazon.com, Barnesandnoble.com, Kobo.com, WorldWeaverPress.com, and other online retailers, and for wholesale through Ingram. You can also find Krampusnacht on Goodreads. I have always had ambivalence about the wholly-wholesome mythology of the holiday season. I mean, I loved getting gifts as a child, and now, as an adult, giving gifts is a great pleasure. But the season is a dark one and cold (in the northern hemisphere, at least), and families are complex – even when happy (and rarely, entirely so)—and holly, jolly Santa fails to address the whole experience. The elder-god-like, demonish Krampus makes a lot of intuitive sense. I suspect some of it is kitsch. Odd traditions and cultural quirks are pretty hip these days, and the idea of a horned beast who hunts naughty children in partnership with/opposition to the anodyne, toothless (metaphorically speaking) Santa has a modern, punk rock appeal. In essence, I’ve written a victim—she, unknowingly, falls for my version of Krampus, who runs his Christmas-themed village like a dictator: a paradise manicured and landscaped by fear. It was difficult to write her so that she is tragic. I wanted her fall to be sympathetic, not pathetic. I didn't know much about the Krampus myth, other than the name (and since part of my ancestry is German-Austrian, shame on me). I had a general mental image of what it looked like, and that it was kind of the counterpart to Santa Claus, but that was about it. Then I saw a creepy old photo online -- probably taken in the 30s or 40s -- and one word popped to mind: Krampus. It really stuck with me and eventually I had to write a story to go with it. Since I didn't know much about the Krampus, I dove into researching it, and though most of what I learned didn't make it into my story, it helped to have all those details at hand, even if it was just for myself. We love scary stories. Reading them, telling them, writing them. And there is something deliciously creepy and satisfying about twisting the otherwise joyous Christmas holiday (or is that just me?). An Anti-Santie? Yes, please. I also love that we writers are expanding our horizons into other cultures as we search for inspiration. So many fascinating folk tales are just waiting to be explored. Creating the voices of the two young main characters was especially challenging for me since I usually write adult characters, and though Marching Krampus is decidedly not for children, the tone and actions of the children in the story had to be realistic. Given the age of the main character, it was also difficult to balance the darkness of the Krampus myth with the scary, yet not nightmare-inducing, tone of the story I wanted to write. 4) If there's something else you'd like to address, feel free. They say a picture is worth a thousand words, and while that may be cliché, it was indeed a picture that inspired my story. Any writers who find themselves blocked or uninspired should consider looking at old photos, new photos, paintings, art anything to break the mold of the same-old, same-old of their writing routine. Don't know the story behind it? Perfect ... now you can give that picture a tale!